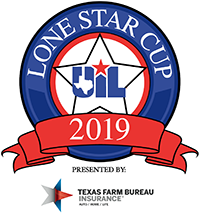 The UIL Lone Star Cup is awarded annually to six high schools, one in each of the six UIL classifications (1A, 2A, 3A, 4A, 5A and 6A), based on their team performance in district and state championships. The winning schools in each classification will receive the UIL Lone Star Cup trophy and a $1,000 scholarship. The UIL would like to thank Texas Farm Bureau Insurance for their sponsorship of the UIL Lone Star Cup. Honoring the best overall athletic and academic programs in Texas, the UIL Lone Star Cup is open to all UIL participant high schools.